Unlike traditional braces, Incognito or lingual braces are placed on the back of your teeth where they cannot be seen easily. This hidden orthodontics method is growing in popularity among those concerned about their appearance with braces. Incognito braces are completely customized to fit your mouth. If you are a working professional, a teen concerned about your appearance, a musician who plays a wind instrument, an athlete who engages in contact sports, or anyone who needs to keep the tooth-straightening behind the scenes, Incognito braces may be for you! What do Miley Cyrus, Duchess Kate Middleton, and Myleene Klass have in common? They all have benefited from the use of lingual braces! You can too! There are many changes you can make to your appearance to help you get a leg up in your social and professional life. One of the best ways to do that is through straightening your smile. The only problem? 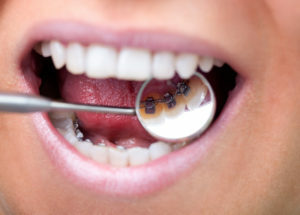 You have to have your teeth professionally straightened so that they are done right. That’s why orthodontists exist and that’s what we specialize in—straightening your teeth. Braces can not only improve your smile, but they can improve your confidence as well. Countless studies show that those who straighten their teeth end up having higher self esteem and confidence. Some studies—such as one done by Invisalign—showed that those with straighter teeth were perceived as more confident, successful, attractive and even trustworthy. Not bad for simply changing your smile, right? Braces also help keep your teeth healthier. How? Crooked teeth provide plaque (and the food that makes plaque) plenty of places to get stuck. Food that becomes stuck is food that will eventually start wearing away your tooth enamel. Food particles become stuck much easier with crooked teeth than they do with straight teeth. Crooked teeth are harder to clean, are more awkward in your mouth, and they can even break easier. When you bite and chew, you exert pressure on your teeth to break up food into smaller pieces. That pressure can cause crooked teeth to crack or break, as some teeth with receive more pressure than other teeth. Straightening your teeth through braces is the best way to get your teeth healthier and prevent broken teeth. For many adults, the thought of wearing braces for months makes them not want to straighten their teeth. That’s despite all the benefits straightening your teeth can give you. Many adults think of traditional metal braces and don’t want others to see a mouth full of metal. Millions have felt this way, so technology changed to allow adults (and even teens) the option of straightening your smile in secret. One of the best ways we straighten your teeth in secret is through Incognito lingual braces. If you’ve never heard of these, then you’re in for a treat! Traditional metal braces straighten the teeth amazingly well. That’s why these braces are referred to as “traditional” metal braces. However, some patients don’t love the thought of having a “metal mouth”. The remedy for that? Braces that lie behind the teeth instead of front and center on the teeth. We call these “incognito” braces because they are a hidden metal apparatus on the tongue-side of your teeth. It’s the perfect solution for having the strength and power of metal braces without compromising your appearance. Millions of people wear braces each year. At least 1/4th of braces wearers are children and about the same amount are adults. Adults need options that allow them to keep their smile white and bright while also straightening it. We custom-make metal brackets for the back of each of your teeth after taking impressions of your mouth. We fit the metal to your teeth and will include brackets and an archwire just like traditional braces. Except, the entire appliance will stay hidden. Others will notice your smile improving over time, but they won’t know that it’s changing through metal braces. Straightening your teeth is easy through Incognito-style braces. 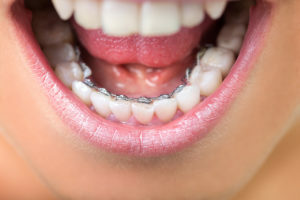 If you’re not completely sold on the idea of Incognito braces, you can call our office to learn more or even come in to the office to see these type of braces for yourself. However, we do have other options you can utilize for straightening your teeth. If you are looking for a similar discrete option comparable to lingual braces, you can investigate Invisalign. Invisalign is a series of transparent aligners that transform your smile into something beautiful. You simply receive custom aligners every 1-2 weeks that slowly shape your smile into the straight pearly whites you’ve always wanted. You can remove the aligners for eating and drinking, sports activities, and for cleaning your teeth. It’s a simple, no-hassle option for straightening your teeth. Clear, ceramic braces are also an option for those who like the idea of braces but also want them to be more hidden than metal on white teeth. Our ceramic materials mimic traditional metal braces (which we also offer), but these materials are naturally white, so they will blend in with your teeth. We can even make the archwire white as well. When it comes to straightening your teeth, you have options. However, our patients love the sturdiness of our Incognito lingual braces mixed with the hidden nature of this type of braces. We think you’ll love this option as well! If you could boost your confidence and self esteem, would you do it? You can through incognito braces! The best part about these amazing appliances is that no one ever has to know you are wearing braces. However, they will notice how awesome your smile looks. Others may even follow your example and straighten their own teeth. If you want to improve your smile today, don’t hesitate to take action! Call our Belmar Orthodontics office today at (303) 225-9016 to learn more about Incognito lingual braces!